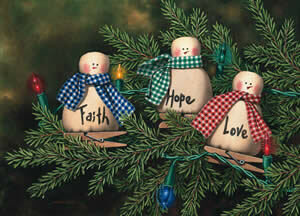 For many years Dempsey has contributed art work to the American Children’s Home and the Baptist Children’s Home of North Carolina for their Christmas cards. The images may be light and whimsical, drawn just for the purpose, or they may be full blown paintings borrowed from a regular release. These images will lift your spirit. Merry Christmas! Oh my gosh...every Snowman Lover has gotta have this. 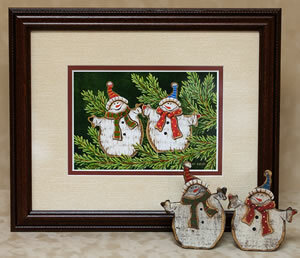 Framed print with matching ornaments. Enjoy year round. Dempsey Essick loves Christmas and that is evident by the Christmas images he chooses to paint, and this year’s “Christmas Mitten” is no exception. 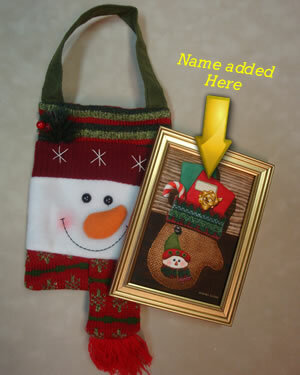 The small signed and numbered print depicts gifts and a candy cane resting inside a hanging Christmas appliquéd mitten with a gift tag personalized uniquely to you! You will find the hidden hummingbird in the stitching underneath the bow. Special to this project is the fact that Dempsey will, at no charge, personalize the gift tag on the print with your name of choice. 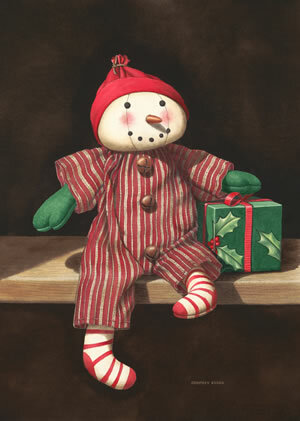 This holiday print is free standing and rests in its own Christmas gift bag. Only from Dempsey Essick do you receive a gift item crafted with so much creativity, thoughtfulness, and love. The pure pleasure of a child’s homemade decorations lasts from Christmas to Christmas. Whether it is a cutout red paper Santa or, perhaps, a couple of hand made snowmen, each year, when you place them on the tree you remember all those past Christmases. Dempsey Essick has captured the spirit of Christmas at home in his painting of “Peace and Joy.” It’s not just about one Christmas but, rather, about a lifetime of Christmases. As always Dempsey has included a hidden hummingbird in the painting. Hint: To locate the hidden hummingbird, follow the strand of lights. 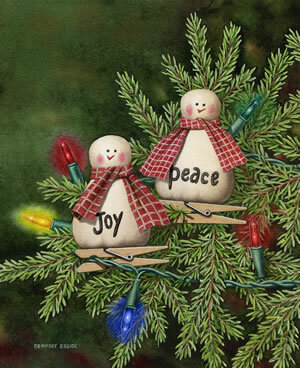 Peace and Joy” was painted for the Baptist Children’s Home 2007 Christmas card. Comes with easel & pair of ornaments. I love Christmas. I have always loved Christmas and I am always sad when it’s over. But this year my holiday was extended. I began working on this piece in December while our tree was still up and I painted on it well into January. Even when our holiday decorations were put away, I still felt the joy of Christmas in my heart. 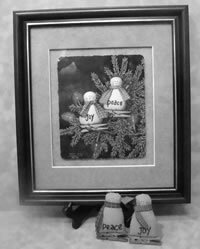 The more I worked on it the more I fell in love with the little homespun snowmen that had been purchased by Shelley in an Atlanta Gift Shop. They brought to mind the three wise men who visited Baby Jesus and I knew that would be a perfect title. I am so pleased that this painting will be used by the North Carolina Baptist Children’s Home as their 2005 Christmas Card. As always, I have included the rebus type image of a hummingbird in the painting. 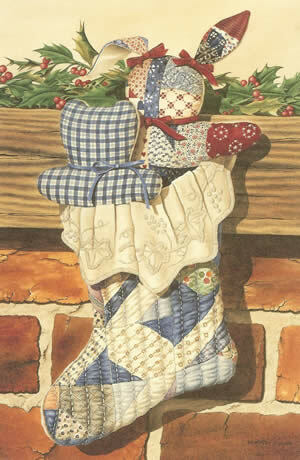 The simple beauty of a Christmas stocking fashioned from the remnants of an old patchwork quilt was the stimulus for "Handmade," Dempsey's fall 1992 release. The monetary worth of a hand-embroidered stocking filled with homemade stuffed animals is negligible, especially in this age of high priced plastic toys. The actual val ue of the handmade gift is in the investment of skill and love by the person who spent untold hours creating the gift. 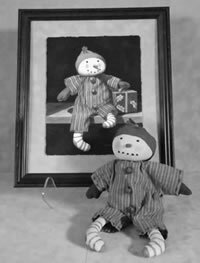 The original painting for "Handmade" was used for the American Children's Home 1991 Christmas card. For several years Dempsey has created the Home's Christmas card design but "Handmade" touched off an avalanche of requests for a full sized print of the painting. In the picture the stocking is hung from a hand-hewn mantel board which tops a fireplace of handmade brick. The wild holly is the only item in the scene that is not made by hand. Dempsey's masterful rendering of the embroidery and quilted fabric with its intricate stitchery and small wrinkles is so real that viewers will be reminded of their favorite Christmas carol.